The whole of Orange County seems to stretch out below this two-story contemporary home at 22750 Hidden Hills Road. 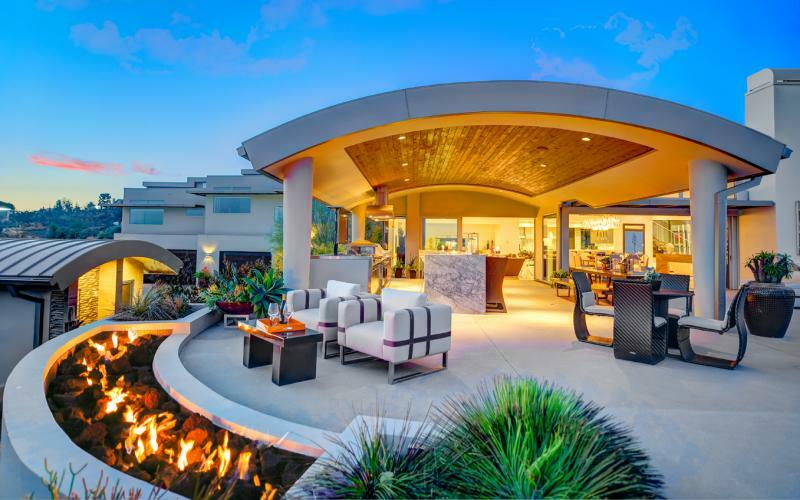 City, coastal, and canyon views are all on stunning display from the 8,320-square-foot interior and the ample outdoor spaces, where you’ll fi nd a zero-edge infinity pool and an open-air kitchen with a pizza oven. But why distinguish inside from outside? In the master bedroom, two walls of sliding doors vanish, and the pool is steps away. The walls of the main living area do a similar disappearing act, all in service of that view. “It’s Hollywood Hills-esque, with views that are truly breathtaking,” says listing agent Raj Qsar of the Boutique Real Estate Group. That’s not all that’s pleasing to the eye. Landscape on the $10 million, 3-acre property is alive with desert simplicity, and 13 olive trees form the perimeter of a meditation garden. The home has stainless-steel, mahogany, and stone finishes, and there’s a home-automation system, a temperature-controlled wine room for 1,200 bottles, and a 13-seat theater. There are seven bathrooms and five bedrooms, plus a garage for four cars.